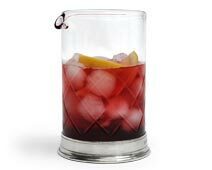 Our pewter or glass pitchers, with graceful symmetrical curves, make a real centrepiece on a table or shelf. Today, the pitcher would still be a stylish and luxurious water jug for the bedroom, but would also make a beautiful centrepiece holding a bouquet of elegantly arranged flowers in the kitchen, bathroom or living room. 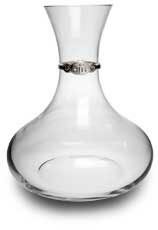 The decanter differs from a carafe because the vessel includes a pewter stopper; the process of decanting has ancient origins, when wine was drawn off from a barrel and carried to the table in a pitcher. The uncorking and decanting of a bottle of wine, the more conventional image of decanting, has played a significant role in medieval Italian households and carried out with an almost ritualistic attention to detail, and the exacting procedure is still followed to this day. 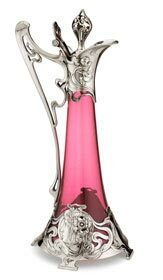 Decanting was historically important to separate clear wine from sediment that had built up after extended aging, and to open-up the wine, making it rounder and richer, after being exposed to air - some would say a decanted wine opens up like a rose in bloom. 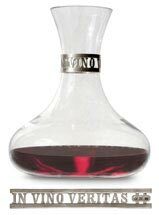 The topic of which wines benefit from decanting is very complex, but as a general rule, the majority of wines benefit from being decanted, irrespective of their price. Maximum impact is achieved when exposing younger, vigorous wines to air, and such wines can benefit from being decanted many hours, or even a day, before serving; this applies to most wines that we drink today. Older, more fragile wines with a delicate fragrance still benefit from being decanted, but for only fifteen or twenty minutes before serving, as they lose their character more quickly.